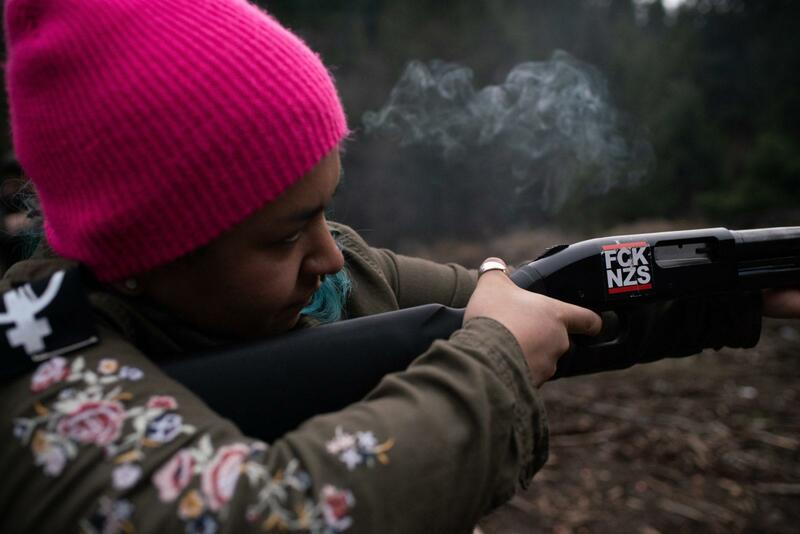 Rosie Strange, a leftist activist who chose to buy a handgun for self defense, fires a friend’s shotgun on February 2, 2019, in Hood River, Oregon. 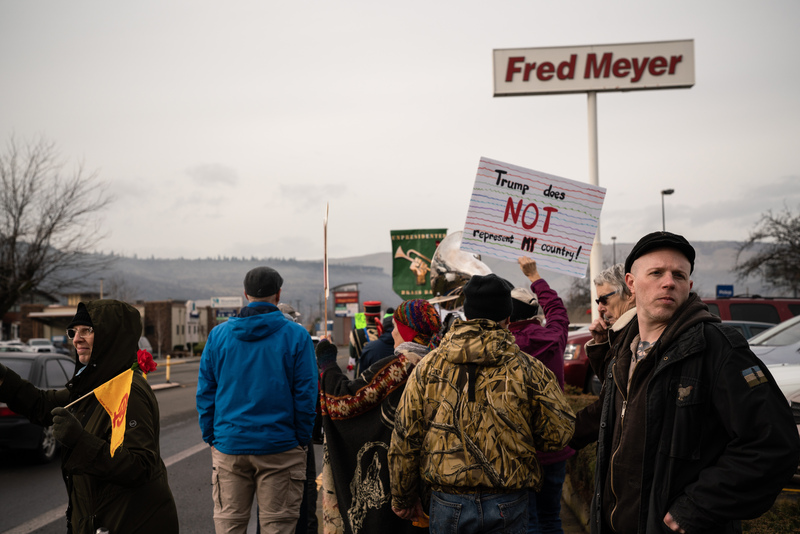 At Oregon’s Columbia River Gorge Women’s March in January, Ross Eliot brought up the rear, more concerned with what might be happening behind the group than keeping pace with the many chants from the roughly 250-person crowd. That threat is on Eliot’s mind today. Tucked under his black jacket is a Springfield Armory XD-S 9 mm handgun. Ross Eliot, a leftist activist and proponent for armed self-defense, looks behind the Women’s March for any possible threats on January 19, 2019 in The Dalles, Oregon. Eliot has been a leftist activist in the Pacific Northwest and proponent of armed self-defense since the 1990s. He says his philosophy is informed by his early experience as an activist in Seattle. Ross Eliot, an activist and proponent of armed self-defense, fires a handgun on February 2, 2019 in Hood River, Oregon. Eliot said spontaneous violence is a serious concern at demonstrations like the Women’s March. He pointed to the white supremacist who stabbed two men on a Portland train in 2017 and the neo-Nazi who killed someone when he drove his car into a crowd of protesters in Charlottesville. What If You Can’t Call The Police? Rosie Strange has been on the receiving end of those threats. 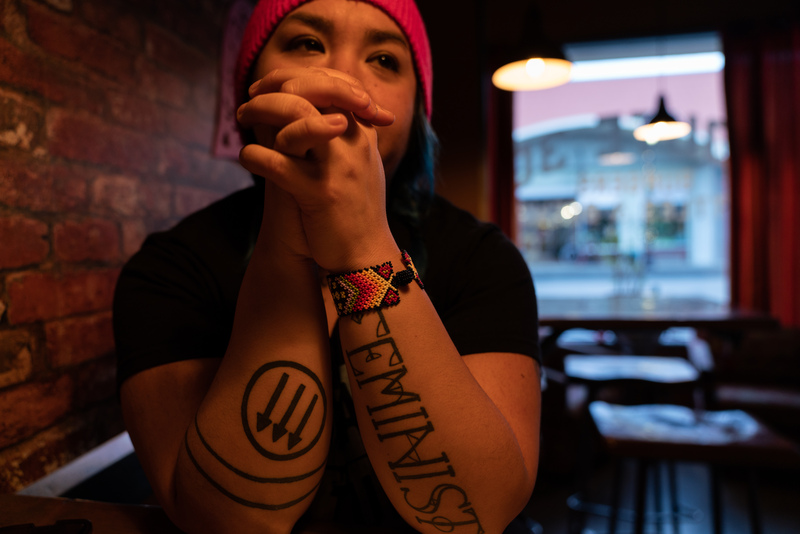 Rosie Strange sits in a restaurant after the Women’s March on January 19, 2019 in The Dalles, Oregon. Her left arm says ‘FEMINIST’ and her right arm has an anti-fascist symbol on it. Strange, whose car is covered in political bumper stickers, usually has protest signs stashed in her trunk. She said she got a sign from her car that said “De-ICE NORCOR” and set it on her table while she ate. Later that day, she started receiving messages from friends. The vitriol came pouring in. She received hundreds of threats and attacks in the comments. In the photo, her face is pixelated, but The Dalles is a small community and she has bright pink hair and tattoos. She’s easily identifiable and said the experience shattered her sense of security. Sherman County Sheriff Brad Lohrey never accused Strange of violating any law and he acknowledged that she had asked the department to take the post down. Lohrey said he would only do so if Strange apologizes to Brandenburg. Strange said she no longer feels like she can rely on the police to protect her. So, she got a gun. Strange knows the statistics that say her gun is more likely to be used against her than to protect her. But she said those statistics lack nuance. “They’re still not able to cover that gap for people like me. Women of color, activists,” she explained. Strange feels relying on police to protect you is a privilege. 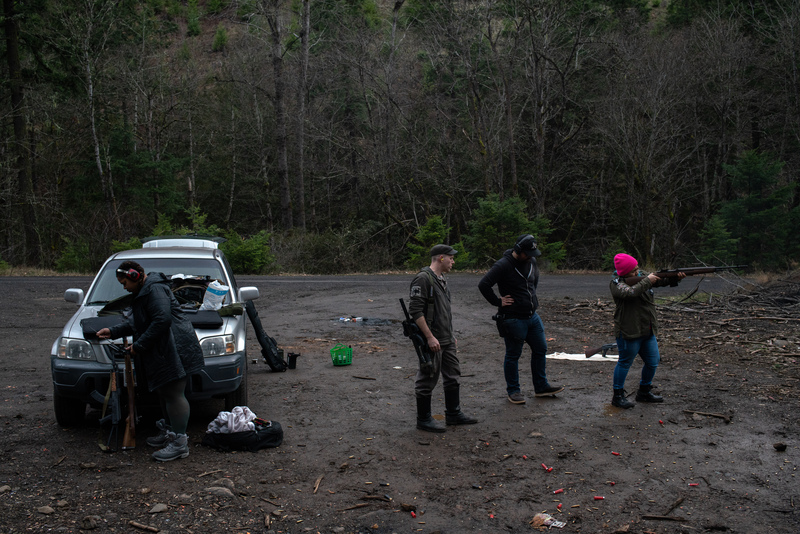 Ross Eliot (center, left) and Rosie Strange (right) take target practice with other activists on February 2, 2019 in Hood River, Oregon. “I refuse to wait for a police officer to get to make the decision of how dangerous my white assailant is,” she said, referring to a past domestic violence incident when she said the police took the word of her white abuser over her own. There’s an old trope in gun control circles: if you’re being robbed, instead of playing the hero with a gun it’s much safer to simply cooperate. Give them what they want. “Well what if they want you dead?” asked Fordham University School of Law professor Nicholas Johnson. Johnson is an expert in firearms law and wrote “Negroes and the Gun”, a book on the history of armed self defense in the black community. He said the civil rights movement is full of examples. And in 1963, civil rights activist Hartman Turnbow used a semi-automatic rifle to defend his home after it was firebombed. Johnson said even the NAACP cut its teeth defending black people who had used guns in self-defense. For example, the organization helped defend Ossian Sweet in 1925 after he was charged with murder for defending himself against a white mob angry that he had moved into their neighborhood. In fact, Johnson said almost every episode in the civil rights movement has some aspect of armed self-defense to it. And, he said, that makes sense. According to Johnson’s reasoning, people who think they have a firm stake in the existing authority structure will feel safe trusting their security to the state. 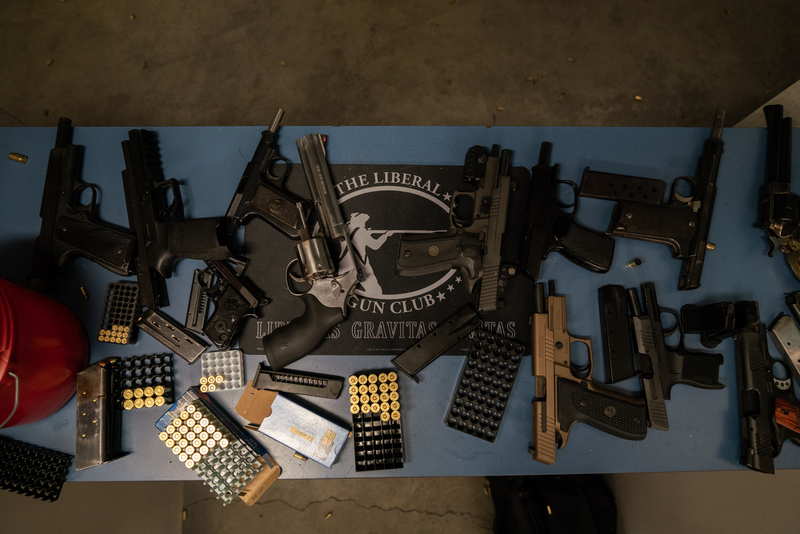 Guns are splayed out at the gun range during The Liberal Gun Club’s winter range day on January 26, 2019 in Portland, Oregon. 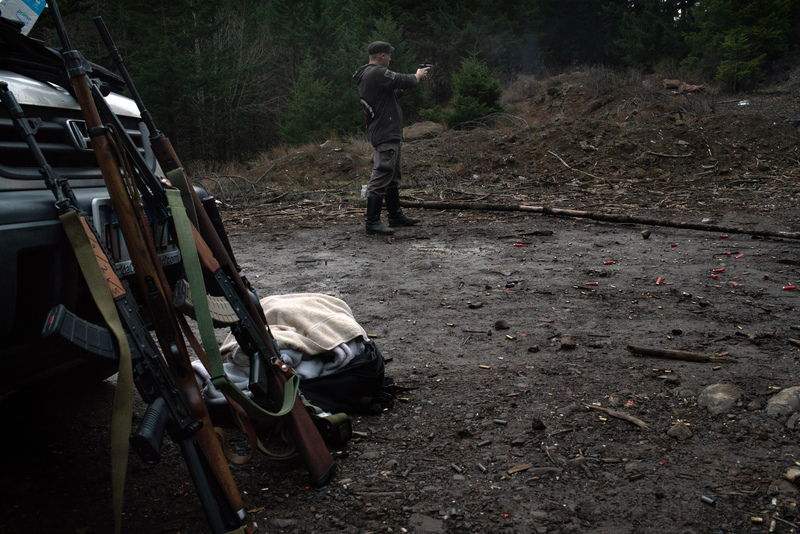 On a Saturday afternoon in January, the Portland chapter of the Liberal Gun Club hosted a winter range day. And while everyone there enjoyed shooting guns, not everyone agreed on their role in society. Phil Phillips and his family moved to Oregon three years ago from Chattanooga, Tennessee. Phillips says he loves target shooting but isn’t convinced that people should own guns for security. And for many Oregonians, Phillips may be right. According to 2014 Department of Justice data, Oregon has the 11th lowest violent crime rate in the country. But for marginalized populations, people who don’t feel safe calling the police, guns look a little different. L.A. Watson-Haley was there too, firing a massive .44 magnum revolver. The enormous pistol matches its owner. Watson-Haley towers over the other shooters. 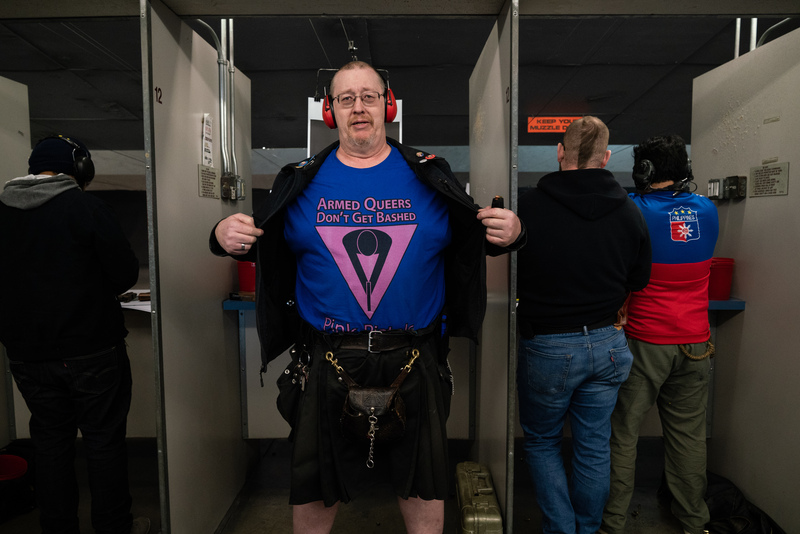 L.A. Watson-Haley shows off his new T-shirt at The Liberal Gun Club’s winter range day on January 26, 2019 in Portland, Oregon. But Watson-Haley, who says he has been shot at before, doesn’t carry a firearm to protect only himself. He says there are three groups of people in society: wolves, sheep and sheepdogs. He said he’ll stand in the middle if he has to.